On "the EIGHTH DAY shall be an HOLY CONVOCATION ("rehearsal" -- #4744) unto you ... it is a SOLEMN ASSEMBLY; and ye shall do NO SERVILE WORK therein.... on the EIGHTH DAY shall be a SABBATH" (Lev.23:36,39). "On the EIGHTH DAY ye shall have a SOLEMN ASSEMBLY; ye shall do NO SERVILE WORK therein" (Num.29:35). "On the EIGHTH DAY was a SOLEMN ASSEMBLY, according to the manner" (Neh.8:18; cp. Ezra 3:4). What Does The Eighth Day Mean? The Bible teaches that the father must circumcise his son on the EIGHTH DAY. The baby's fleshly foreskin is cut off and thrown away on that day which echoes the time after the 7th millenial day of rest when the second resurrection from human to spirit beings occurs. All human flesh will at that time be cut off and thrown away. All will be composed of SPIRIT (circumcised) (1Cor 15:22-26;Rom 6:23). A leper was to remain outside his tent SEVEN DAYS (Lev. 14:8). On the EIGHTH DAY he was presented before the Lord. Also the firstborn of any animal was to remain with its mother for SEVEN DAYS. On the EIGHTH DAY it was brought to God as an offering (Ex.22:30). These verses typify misguided mankind being resurrected after 7000 years and brought to God's truth. This will be the beginning of the eighth millenium typified by the EIGHTH DAY. Debts were released to Israelites at the end of every SEVEN YEARS (Deut. 15:1). In the EIGHTH YEAR they could begin again debt-free unless they were foreigners (Deut. 15:3). These verses typify misguided mankind being resurrected after 7000 years and having their sins forgiven. In the eighth millenium they can begin again unless they refuse to repent. Also, the reading of the law is commanded at the end of SEVEN YEARS (Deut. 31:10) -- in the EIGHTH YEAR. This verse typifies humanity resurrected after 7000 years and commanded to read the law of God -- beginning in the eighth millenium. Why Do We Rejoice in the Law? Jesus was questioned by the scribes and Pharisees regarding a woman taken in adultery (John 8:1-11) on this EIGHTH DAY known as "REJOICING in the TORAH." 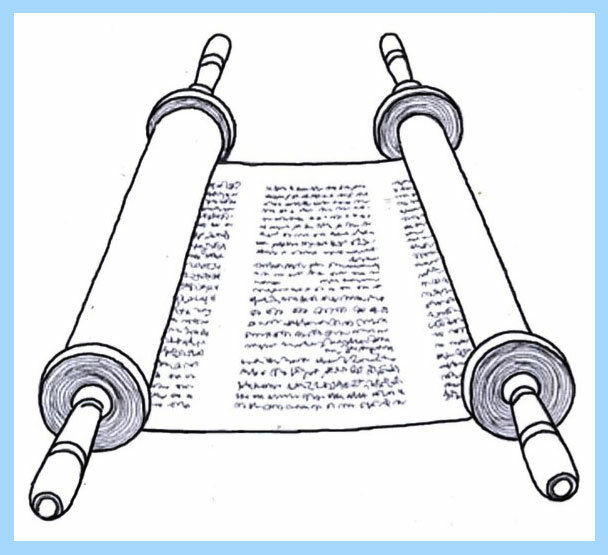 (Simchat Torah). They said she should be stoned to death. Jesus wrote their names and sins in the temple earth because "they who depart from me shall be written in the earth" (Jer. 17:13) and mentally gave them "of the dust that is in the floor of the tabernacle" to drink (Num.5:11-31). Then he said to them, "He that is without sin among you, let him first cast a stone at her" (8:7). Her accusers all walked away, so Jesus said, "Woman, where are those thine accusers? Hath no man condemned thee? She said, No man, Lord. And Jesus said unto her, Neither do I condemn thee; go, and sin no more" (8:10-11). Jesus' mercy is one reason we can REJOICE in the LAW. The "last ... great day" (John 7:37) was the seventh day of the Feast of Sukkot -- Hoshanah Rabbah (meaning "Save Us"). Then on the EIGHTH DAY "early in the morning (when it was still dark, except for the LIGHT of the temple), he came again into the temple and all the people came unto him; and he sat down, and taught them...." (John 8:2). The EIGHTH DAY (2 Macc.10:6; Ant.3:10:4) is referred to as a "sabbath day" in John 9:14, confirming the fact that it is the EIGHTH DAY of Leviticus 23:39. On the EIGHTH DAY, three golden CANDELABRAS, with four bowls each, were in the Court of the Women and LIT UP not only the temple area but also every court in Jerusalem (pp.283-285, Edersheim's Temple; Sukkah 5:3). What did Jesus teach them on this EIGHTH DAY? "Then spoke Jesus again unto them, saying, I am the LIGHT of the world; he that followeth me shall not walk in DARKNESS, but shall have the LIGHT of life" (John 8:12; cp.9:5 & 12:46). Then Jesus healed a man born BLIND (John 9) typifying the BLIND condition of LOST ISRAEL (Isa. 42:19; 44:1) and the WORLD in general which will be healed fully on this day. "And Jesus said, For judgment I am come into this world, that they who SEE NOT (LOST TEN TRIBES and the whole WORLD) might SEE; and that they who SEE (the JEWS), might be made BLIND" (John 9:39). In other words, CHRISTIANITY has been accepted by BLIND ISRAEL and many GENTILES -- "the babes" -- but has been rejected by most JEWS -- the"wise and prudent" -- who obey the law (Matt.11:25; 1 Cor.1:26-29). The light was seen as a symbol of the Shekinah Glory in the Holy of Holies (1 Ki. 8:10-11; Ez.43:5). "The people that walked in DARKNESS have seen a great LIGHT; they that dwell in the land of the SHADOW of death, upon them hath the LIGHT shined" (Isa.9:2). Jewish Christians are "sons of LIGHT" (John 12:36). "Arise, SHINE; for thy LIGHT is come, and the GLORY of the Eternal is risen upon thee" (Isa.60:1). The EIGHTH DAY symbolizes a time when the truth will be ILLUMINATED for all who have been spiritually BLIND. Now if the HUMAN BODY is a SUKKAH (2 Pet. 1:14; 2 Cor. 5:1,4), and if LIVING IN SUKKAHS during the SEVENTH MONTH pictures GOD LIVING IN HUMANS during the MILLENIUM, then it follows that the EIGHTH DAY when we NO longer LIVE IN SUKKAHS must picture a time AFTER the MILLENIUM when all HUMANS have either been DESTROYED or made IMMORTAL. If there are NO SUKKAHS then there are NO HUMANS. "On the EIGHTH DAY he (Solomon) sent the PEOPLE AWAY " (1 Kings 8:66). Everybody takes down his BOOTH on the EIGHTH DAY. Yes, "death and hell (the grave) were CAST INTO the lake of fire. This is the second death. And WHOSOEVER was not found written in the book of life was CAST INTO the lake of fire" (Rev.20:14-15). And "there shall be no more death" (Rev.21:4). "But the FEARFUL (afraid what their friends might think), and UNBELIEVING (agnostics, atheists), and the ABOMINABLE (pork eaters), and MURDERERS (abortionists; mercenary soldiers), and WHOREMONGERS (fornicators; divorcees), and SORCERERS (drug pushers), and IDOLATERS (Catholic priests), and all LIARS (who lie to defraud rather than to protect the innocent), shall have their part in the lake which burneth with fire and brimstone, which is the SECOND DEATH" (Rev.21:8). "For if we SIN WILFULLY after we have received the knowledge of the TRUTH, there remaineth no more sacrifice for sins, But a certain fearful looking for of JUDGMENT and fiery indignation, which shall devour the adversaries" (Heb.10:26-27). Sinners will be resurrected "to shame and everlasting CONTEMPT" (Dan.12:2) as they realize their FATE (Luke 16:24). "For, behold, the day (EIGHTH DAY) cometh, that shall burn like an oven, and all the proud, yea, and all that DO WICKEDLY, shall be STUBBLE; and the day that cometh (EIGHTH DAY) shall burn them up, saith the Eternal of hosts, that it shall leave them neither root nor branch.... And ye shall tread down the WICKED; for they shall be ASHES under the soles of your feet in the day (EIGHTH DAY) that I shall do this, saith the Eternal of hosts" (Mal.4:1-3). This is the baptism "with FIRE" (Luke 3:16). Just like the flood of water covered the earth (2 Pet.3:5-7), so also a FIRE will engulf the entire earth and "the earth ... and the works that are in it, shall be BURNED UP" (2 Pet.3:10; cp. Isa.51:6; Matt.25:41; cp. Ez.18:31-32). After "the heavens ... vanish away like smoke, and the earth" grows "old like a garment, and they that dwell therein shall DIE in like manner (dismantling the SUKKAH)" (Isa.51:6), God will "create new heavens and a new earth (the PERMANENT HOME the bride moves into after the seven-day wedding feast), and the former shall not be remembered, nor come to mind" (Isa.65:17). And "as the new heavens and the new earth, which I will make, shall remain before me, saith the Eternal, so shall your seed and your name remain" (Isa.66:22). Yes, "the heavens, being on fire, shall be dissolved, and the elements shall melt with fervent heat ... Nevertheless we, according to his promise, look for new heavens and a new earth, in which dwelleth RIGHTEOUSNESS" (2 Pet.3:13; cp. Ps.102:25-28; Heb.1:10-12). "And I saw a new heaven and a new earth; for the first heaven and the first earth were passed away, and there was no more sea" (Rev.21:1). "And I, John, saw the holy city, new Jerusalem (the PERMANENT HOME after dismantling the SUKKAH), coming down from God out of heaven, prepared as a bride adorned for her husband" (Rev.21:2). Behold "I create Jerusalem a rejoicing, and her people a joy. And I will rejoice in Jerusalem, and joy in my people; and the voice of weeping shall no more be heard in her, nor the voice of crying" (Isa.65:18-19). "Awake, awake (to the resurrection to life); put on thy strength, O Zion; put on thy beautiful garments, O Jerusalem, the holy city; for henceforth there shall no more come into thee the UNCIRCUMCISED and the UNCLEAN. Shake thyself from the dust, arise (from your graves in a resurrection), and sit down, O Jerusalem" (Isa.52:1-2; cp. Rev.21:10--27 & Gal.4:26). This is the time of the "restitution of all things, which God hath spoken by the mouth of all his holy prophets since the world began" (Acts 3:21). After this, perhaps God will "plant the heavens" (Isa.51:16) with immortal sons and daughters of God creating new worlds on other planets since there will be no end to the increase of God's government and family (Isa.9:7). There may be more significance than most people realize to the fact that JEWISH CHRISTIANS are compared with STARS (Dan.8:10; 12:3; 1 Cor.15:38-41; see also Ps.147:4). year to year, we picture the resurrection FROM HUMAN TO DIVINE. How Will Mankind Be Judged? GOODor BAD" (2 Cor.5:10). God "will render to every man according to his DEEDS: To them who by patient continuance in WELL-DOING seek for glory and honor and immortality, ETERNAL LIFE; But unto them that are CONTENTIOUS, and DO NOT OBEY the TRUTH, but obey UNRIGHTEOUSNESS, indignation and wrath" (Rom.2:6-8). Christ will be "the JUDGE of quick (living) and dead" (Acts 10:42). "But I say unto you that every IDLE WORD that men shall speak, they shall GIVE ACCOUNT of it in the day of judgment. For by thy WORDS thou shalt be JUSTIFIED, and by thy WORDS thou shalt be CONDEMNED" (Matt.12:36-37). Therefore, "he that REFRAINETH his LIPS is WISE" (Pr.10:19; 17:27). "God trieth the hearts and reins" (Ps.7:9). "For as the Father raiseth up the dead, and quickeneth them (gives them life), even so the Son quickeneth (gives life to) whom he will. For the Father JUDGETH NO MAN, but hath committed all JUDGMENT unto the Son" (John 5:21-22). "Let us hear the conclusion of the whole matter: Fear God, and KEEP HIS COMMANDMENTS; for this is the whole duty of man. For God shall bring EVERY WORK into JUDGMENT, with every SECRET thing, whether it be GOOD, or whether it be EVIL" (Eccl.12:14). "To give every man according to his ways, and according to the fruit of his doings" (Jer. 17:10). "For nothing is SECRET, that shall not be MADE MANIFEST; neither any thing HIDDEN, that shall not be KNOWN and come abroad (to light)" (Luke 8:17). We are saved by grace, but REWARDED according to our WORKS. Our daily thoughts, words and deeds count for eternity. What are we living for -- self, money, power, fame or God? A prophecy explaining the fulfillment of this day says that "the REST of the DEAD lived not again UNTIL the thousand years were FINISHED" (Rev.20:5). Then John says, "And I saw a GREAT WHITE THRONE, and him that sat on it, from whose face the earth and the heaven fled away, and there was found no place for them. And I saw the DEAD small and great, STAND before God, and the BOOKS were OPENED (The books -- "biblos" -- of the Bible were opened to their understanding is one interpretation. Another is that these are the book of the righteous, the book of the wicked and the book of remembrance); and another book was opened, which is the book of life. And the DEAD were JUDGED out of those things which were written in the books according to their WORKS" (Rev.20:11-13). Yes, "the JUDGMENT was SET (the court was seated), and the BOOKS were OPENED" (Dan.7:10). As John 12:48 says, "He that rejecteth me, and receiveth not my words, hath one that JUDGETH him: the WORD that I have spoken, the SAME shall JUDGE him in the LAST DAY." (The EIGHTH DAY). Jews recite Yizkor -- prayers for the dead -- on this day (see Midrash Pesikta 20). All HUMANITY has been CUT OFF from God for 6000 YEARS since Adam and Eve chose the tree of the knowledge of good and evil rather than RELYING ON GOD to tell them what was good or evil. Adam chose death rather than life. Since Adam REJECTED God's KNOWLEDGE, God CUT MAN OFF from that REVEALED KNOWLEDGE -- except for a very FEW. God wants humanity to learn the bitter lesson by experience that SIN DOESN'T PAY and that His ways and methods are the best. The first 6000 YEARS represent the first SIX DAYS of the week when man toils and goes HIS OWN WAY and does his own thing. The seventh 1000-YEAR PERIOD is God's SABBATH of rest when men will learn God's ways. From then on, nobody will be cut off from God. God is RESPONSIBLE for BLINDING humanity now, but Satan is the one to BLAME (Rev.12:9). Once a person KNOWS BETTER, yet CONTINUES in sin, he cannot claim IGNORANCE as a excuse and must bear part of the BLAME also. resurrection after 7000 years)" (Dan.12:2). Yes, "in Christ shall all be made alive; But every man in his own order: Christ the first fruits; afterward they that are Christ's at his coming (FIRST RESURRECTION to IMMORTALITY). Then cometh the end, when he shall have delivered up the kingdom of God, even the Father, when he shall have put down all rule and all authority and power (RESURRECTION to MORTALITY). For he must reign, till he hath put all enemies under his feet. The last enemy that shall be destroyed is death" (1 Cor.15:22-26). Jesus the Messiah "shall judge the quick (living) and the dead at his appearing (FIRST RESUR RECTION to IMMORTALITY) and his kingdom" (SECOND RESURRECTION to MORTALITY) (2 Tim.4:1). GOD IS REPRODUCING HIMSELF. He created man in his PHYSICAL IMAGE and intends to create man in his CHARACTER IMAGE. "We all ... are being changed into his likeness" (2 Cor.3:18). The captain of our salvation was made "perfect through sufferings." And "in bringing many sons unto glory" (Heb.2:10), he must make us perfect through sufferings as humans too or we will not qualify. If this life is the only chance we have of salvation, and if God is like a farmer, then He is only able to harvest about ONE FIFTH of his crop. That is the PERCENTAGE of the world that professes to believe in CHRISTIANITY. And less than ONE PERCENT of the world is JEWISH. To find JEWISH CHRISTIANS among the world's population is next to impossible. But the truth is that God only called ONE MAN in each generation from Adam to Noah as a preacher of righteousness (2 Pet.2:5). After Noah, we only read about ABRAHAM'S FAMILY of descendants -- most of whom were never converted. Missionaries are under the false pretension that there is a GREAT BATTLE between God and Satan -- that God is desperately trying to SAVE LOST SINNERS before they die and it's too late. He is portrayed as LOSING this battle to SATAN because Jewish Christians are only a SMALL MINORITY of the world's population. This is ridiculous. Christ said, "No man CAN COME to me, EXCEPT the Father, who hath sent me, DRAW HIM; and I will raise him up at the LAST DAY" (John 6:44). Christ will raise him up on the EIGHTH DAY. There is NO CONTEST. Missionaries busily go from house to house trying to convert people. But Christ said, "GO NOT from house to house" (Luke 10:7). Instead, Paul "received all that CAME in UNTO HIM" (Acts 28:30) and only visited CONVERTED people "from house to house" (Acts 20:20). Christ even said "GO NOT in the way of the GENTILES" (Matt.10:5-6) at one point. Later, after the church was started, he said, "Go ye, therefore, and TEACH ALL NATIONS" (Matt.28:19). We see that most of the world is "without Christ, being ALIENS from the commonwealth of Israel, and strangers from the covenants of promise, having no hope and without God in the world (Eph.2:12). But when the EIGHTH DAY is fulfilled, "the GENTILES (will) ... be fellow heirs, and of the same body, and partakers of his promise in Christ" (Eph.3:6). God is "not willing that ANY should perish, but that ALL should come to repentance" (2 Pet.3:9). God wants "ALL MEN to be saved, and to come unto the knowledge of the truth" (1 Tim.2:4; cp. John 6:39-40). The "times of this ignorance (in the majority of MANKIND) God winked at (overlooked), but now commandeth ALL MEN everywhere (orientals, blacks and whites) to repent, because he hath appointed A DAY , in which he will JUDGE the world in righteousness" (Acts 17:30-31). That day will be the EIGHTH DAY when the majority of mankind will be given its FIRST and ONLY opportunity to hear the message of salvation. "For God so loved the WORLD, that he gave his only begotten Son, that whosoever believeth in him should not perish, but have everlasting life" (John 3:16). "And whosoever shall not receive you, nor hear your words, when ye depart out of that house or city, shake off the dust of your feet. Verily I say unto you, It shall be MORE TOLERABLE for the land of Sodom and Gomorrah in the DAY of JUDGMENT (EIGHTH DAY), than for that city" (Matt.10:14-15). "Martha saith unto him, I know that he (my dead brother Lazarus) shall rise again in the resurrection at the LAST DAY" (John 11:24). The EIGHTH DAY -- the white throne JUDGMENT. "Woe unto thee, Chorazin! Woe unto thee, Bethsaida! For if the mighty works, which were done in you, had been done in Tyre and Sidon, they would have repented long ago in sackcloth (burlap sacks) and ashes, But I say unto you, It shall be MORE TOLERABLE for Tyre and Sidon at the DAY of JUDGMENT (EIGHTH DAY), than for you. And thou, Capernaum, which art exalted unto heaven, shalt be brought down to hell (the grave); for if the mighty works, which have been done in thee, had been done in Sodom, it would have remained until this day. But I say unto you, That it shall be MORE TOLERABLE for the land of Sodom in the DAY of JUDGMENT (EIGHTH DAY), than for thee ... I thank thee, O Father, Lord of heaven and earth, because thou hast hidden these things from the wise and prudent (Jews in Chorazin, Bethsaida and Capernaum were wise and prudent [cp. Isa.29:14 & 1 Cor.2:6]) and hast revealed them unto babes" (Matt.11:21-25). These three cities were all located around the Sea of Galilee. Tyre and Sidon were destroyed by Alexander the Great and Sodom was destroyed by fire and brimstone (Gen.19:24). "The men of Nineveh shall rise in JUDGMENT (in a resurrection on the EIGHTH DAY) with this generation, and shall condemn it; because they repented at the preaching of Jonah; and, behold, a greater than Jonah is here (Jonah typified Christ -- Matt.12:40). The queen of the south (south of Palestine) shall rise up in the JUDGMENT (in the resurrection on the EIGHTH DAY) with this generation, and shall condemn it; for she came from the uttermost parts of the earth to hear the wisdom of Solomon; and, behold, a greater than Solomon is here" (Matt.12:41-42). The Persians and Scythians destroyed Nineveh in 612 B.C. after it had degenerated from the days of Jonah. In other words, the Jews of Christ's day were MORE GUILTY than the people of Sodom, Gomorrah, Tyre, Sidon, Nineveh, the queen of the south, and even the Kingdom of Samaria. The world will be judged by a jury of its peers from all different eras and locations. Judah went up first to battle (Judges 1:1-2). The "oracles of God" were committed to Jews (Rom.3:2). True Christians are called Jews (Rom.2:29), and Jews were the last to go into captivity. Even Messiah was incarnated as a Jew (John 4:9; Heb.7:14; Rev.5:5). But even Judah became corrupt. As God said, "Sodom, thy sister, hath not done, she nor her daughters, as thou ("Jerusalem" -- Ez.16:3) hath done, thou and thy daughters... Neither hath Samaria committed HALF of THY SINS, but thou hast multiplied thine abominations MORE THAN THEY, and hast JUSTIFIED thy sisters in all thine abominations which thou hast done.... thou hast committed MORE ABOMINATIONS than they; they are MORE RIGH-TEOUS than thou ... When I shall bring again their captivity (from death in the second resurrection on the EIGHTH DAY), the captivity of Sodom and her daughters, and the captivity of Samaria and her daughters, then will I bring again the captivity of thy captives in the midst of them ... When thy sisters, Sodom and her daughters shall return to their former estate, and Samaria and her daughters shall return to their former estate, then thou and thy daughters shall return to your former estate" (Ez.16:48-55) during the WHITE THRONE JUDGMENT period of one hundred years called the EIGHTH DAY. Israel.... And shall put my Spirit in you, and ye shall live, and I shall place you in your own land; then shall ye know that I, the Eternal, have spoken it, and performed it, saith the Eternal" (Ez.37:1-14). Virtually all of the Old Testament Israelites died WITHOUT ever RECEIVING God's HOLY SPIRIT. They had some knowledge of the plan of salvation (Heb.4:2), but lacked the faith and obedience (Deut.5:29). They weren't promised salvation. They thought THEY WERE LOST, but they just WEREN'T JUDGED yet. The resurrection at the end of the Millenium is clearly a resurrection back to PHYSICAL LIFE of BONES and FLESH. "On Sukkot Israel was commanded to offer 70 bullocks for the atonement of the 70 Gentile nations; but on Shemini Atzeret, God enjoined only one bullock for the sake of Israel" (Pesikta Buber p. 193). Perhaps this means that unconverted Israel will be resurrected to physical life after all the other nations. "So the last shall be first, and the first last; for many are called, but few chosen" (Matt. 20:16). "Hath God cast away his people? God forbid.... Israel hath not obtained that which he seeketh for; but the election (the church) hath obtained it, and the rest were BLINDED ... For if the casting away of them be the reconciling of the world, what shall the receiving of them be, but life from the dead? (on the EIGHTH DAY) ... BLINDNESS in part is happened to Israel, until the fullness (full number) of the Gentiles be come in. And so all Israel shall be saved; as it is written, There shall come out of Zion the Deliverer, and shall turn away ungodliness from Jacob ... How unsearchable are his JUDGMENTS" (Rom.11:1-33). Yes, God has THREE JUDGMENT PERIODS and Israel will be in the LAST of those THREE JUDGMENT PERIODS and have her BLINDNESS cured by Jesus Christ. This will be the large FALL FRUIT HARVEST. EVERYBODY then ALIVE. After 7000 YEARS, EVERYBODY who ever lived in ignorance will be resurrected back to physical life and offered salvation. "For the kingdom of heaven is like a man ... who went out EARLY in the MORNING to hire laborers into his vineyard. And when he had agreed with the laborers for a penny a day, he sent them into his vineyard. And he went out about the THIRD HOUR, and saw others standing idle in the market place, And he said unto them, Go ye also into the vineyard, and whatever is right, I will give you.... Again he went out about the SIXTH AND NINTH HOUR, and did likewise.... So when even (evening) was come, the lord of the vineyard saith unto his steward, Call the laborers, and give them their hire, beginning from the LAST FIRST. And when they came that were hired about the ELEVENTH HOUR, they received every man a penny. But when the FIRST came, they supposed that they should have received more; and they likewise received every man a penny. And when they had received it, they murmured ... Saying, These LAST have wrought (worked) but one hour, and thou hast made them equal unto us, who have borne the burden and heat of the day. But he answered one of them, and said, Friend, I do thee no wrong. Didst not thou agree with me for a penny? ... Is it not lawful for me to do what I will with mine own? ... So the LAST shall be FIRST, and the FIRST LAST; for many are called, but few chosen" (Matt.20:1-16). Yes, the FIRSTBORN of an animal was always reserved for God. However, the owner had to leave it with its mother for SEVEN DAYS (7000 years). On the EIGHTH DAY it was brought to God as an offering (Ex.22:30). Those born LATER, AFTER the first coming of Christ, will be given salvation FIRST (the penny), BEFORE those born PRIOR to the first coming of Christ. Also, those converted LATE in their lives will be given salvation (the penny) to the same extent as those converted EARLY in their lives. In addition to salvation, the penny may also symbolize being rewarded according to our works (Matt.16:27). Thus we know that God will reward us all based on WHAT WE DO with WHAT WE HAVE (Matt. 25:14-30; Luke 19:11-27) in the TIME we have each been GIVEN (Matt.20:1-16). We're SAVED by his GRACE but REWARDED according to our WORKS. Abib 1 and Tishri 1 parallel eachother. Both begin the new year. Passover and Atonement both parallel Messiah's sacrifice. Unleavened Bread and Sukkot both parallel the journey from Egypt to the Promised Land. Pentecost ends the grain harvest just as the Eighth Day ends the fruit and nut harvest. The Old Covenant physical marriage fulfilled the spring festivals and the New Covenant spiritual marriage will fulfill the fall festivals. The small grain harvest fulfilled the spring festivals and the large fruit harvest will fulfill the fall festivals. The Messiah's first coming fulfilled the spring festivals and Messiah's second coming will fulfill the fall festivals.